Pruning is one of the most important cultural operations in grape production because it regulates both vegetative growth and fruit production. To properly prune a vine, you should know something about its growth and fruiting habit. The following image shows the major parts of a dormant vine after being pruned. This vine has been trained to the four-arm Kniffin system, one of several training systems used. The fruit is borne on shoots rising from one-year-old wood. The most productive canes are about pencil thickness (0.25-inch to 0.30-inch) and have an internodal length of five to eight inches between the fifth and sixth nodes or buds. To keep the fruiting wood close to the main trunk, leave one or two renewal spurs on or near each arm. (Cut back to short spurs leaving one to four buds). Prune the vine so you will maintain a balance between vegetative growth and fruit production. Where a vine is under pruned, (too many buds left) the vine will produce many small clusters of small grapes that may fail to ripen properly. If the vine is over pruned, (too few buds left) the yield will be low and the vegetative growth excessive. To "balance prune" a vine, the number of buds left is adjusted according to the amount of one-year-old wood removed in pruning. There are two basic systems of pruning. 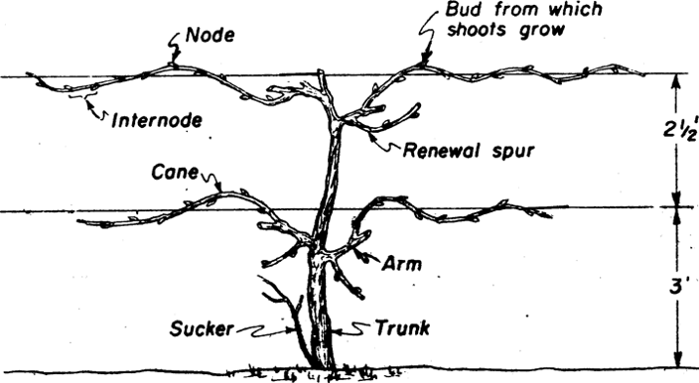 How you prune will depend on the individual grape variety you grow and which part of its canes can be expected to bear the fruitful buds. Commonly used for the Concord and other American varieties, is best suited to vines whose canes are most fruitful at a considerable distance from the base. On these vines, fairly long canes are left for fruiting wood and only the wood that is retained for renewal is cut back short. Select the best-placed canes for renewal and cut them back to 2 buds each. Select the best-quality canes for fruiting. Decide how many buds the whole vine should bear. Cut back the fruiting canes according to their vigor and size, and that of the vine. Remove the rest of the wood. Tie the vine to the trellis wire. This method is more successful for most French hybrids since most of these varieties bear their most fruitful buds near the base of the canes. On these vines, all wood is spur-pruned, or cut back to the short spurs for both renewal and fruit production. Select the best-placed, most fruitful canes. Cut enough canes back to 2-bud spurs. Pruning is done during the winter, while the plant is dormant. The later in the dormant season that you prune, the later new growth will begin in the spring. Temperatures as low as -10° to -15° F may result in injury to the wood and buds of most grape varieties. In cold weather the frozen wood is brittle and easily broken: therefore it is advisable not to prune until late winter or early spring. When pruning is done late in the dormant season, the canes may “bleed” or drip sap from the cut ends. This is harmful to the vines. 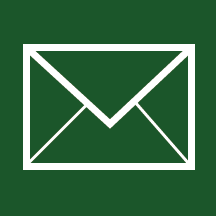 Summer pruning or pruning while the vine is in a green or growing state can severely weaken its development. The green parts of the plant, its leaves, manufacture its food supply. Once removed, some of the food needed for growth is also removed. If any disbudding, removal of watersprouts, or suckering is needed, complete it early enough in the growing season that it will not injure the vine. Under no circumstances should growing shoots be cut back or any other green parts of the plant be removed. The best guide for determining how many buds to leave for fruiting is a measure of the past year's growth. Count the number of buds left the prior year and examine the canes that grew from those buds for diameter, length, and quality. If the canes are at or near the best size and quality for fruiting wood leave the same number of buds. If the canes are small too many buds were left last year. Reduce the number in this year's pruning. If the canes are larger than optimum or show excessive vigor of "bull" canes leave more buds than were previously left on the vine. If you are not sure how many buds to retain it is better to prune more severely than to underprune. Leave fewer buds especially if the vine is a weak grower. If the vine has been very vigorous retain more buds. Apparent vigor is not always a true indication of capacity under certain conditions. For example, young blossoms may be destroyed by a late frost, insects, or disease. When this happens, the shoots have increased vigor but not because the vine was under pruned. Do not leave more buds in this case. Keep in mind the size of the crop produced the previous year and always balance the number of buds on each cane or spur with the vigor of the cane selected for fruiting.